While foot care is often at the bottom of people’s lists when it comes to overall health, diabetics, in particular, should especially pay attention to their feet. Diabetics are 20 times more likely to have a toe or foot amputated due to an infected wound. These wounds will often develop due to lacking foot care and lacking knowledge about conditions that plague diabetic feet, such as diabetic neuropathy. High blood sugar and a lack of oxygen due to poor blood flow cause nerve damage in the feet, which allows for wounds to develop painlessly and undetected. For many diabetics, these wounds will continue to exacerbate until it is too late. Getting a diagnosis early on can help diabetics learn proper management of their diabetic feet. Diabetics must pay special attention to their feet to help prevent any complications. If you have diabetic foot concerns, consult with one of our podiatrists from Foot HealthCare Associates. Our doctors will provide quality care for your diabetic feet. Diabetes affects millions of people every year. Diabetes can damage blood vessels in many parts of the body, including the feet. 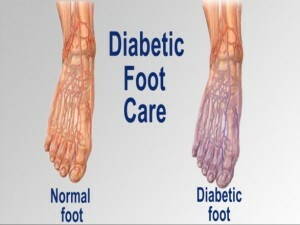 Because of this, taking care of your feet is essential if you have diabetes. It’s wise to have a podiatrist help monitor your foot health as well. If you have any questions, please feel free to contact one of our offices located in Michigan. We offer the newest diagnostic and treatment technologies for all your foot care needs.